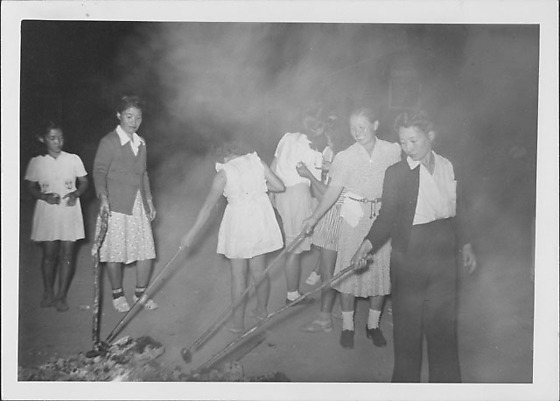 Three women and a girl stand around open fire roasting food on long sticks while girls stand around at Rohwer concentration camp, Rohwer, Arkansas, September 9, 1944. Fire at BLC. Three women face viewer, holding stick in proper R hands. Girl faces opposite direction, holding stick in proper L hand. Barracks barely visible through smoke, TR. Written in green ink on back: Sept. 9, 1944.